We rescued a 1 year old pit bull from the pound. 99% of the time she is sweet playful and very loving and just craving for attention, she walks beautifully on the leash until she sees a man walking, she gets up on her hind legs and barks until he has passed and is out of sight, she did actualy bit the neighbor, not hard but broke the skin. We can either break this habit or had her put to sleep, any ideas on what to do. We have had her for just over a month. Your problem is that your dog didn't get a motivational correction for exhibiting the aggressive behavior. It will happen, again. Plan on it. Be prepared, and have a way to administer a motivational correction, when it happens-- so that your dog knows in no uncertain terms: This behavior will not be tolerated. I go into more detail on how to do this, in my book. In addition: Start teaching her obedience training exercises, and make her do behaviors she doesn't want to do. (Ex. Down-stays around distractions and making him stay down). That builds dominance/leadership and makes your corrections more meaningful. Aggressive Dog Training Tips Newsletter. My partner and I adopted Troy (part Corgi part Daschund) when he was about 2 months old. We didn't know much about his previous owners but they claimed that they had cats which did not get along with Troy so had to give him away. We already had another male dog at that time which was about the same age as Troy. They got along ok in the beginning but started growling and attacking each other when we had a third dog, a female this time. That was when both were about 6 months old. Both wanted to be top dogs and neither would give in to the other. We had to separate both the males from each other all the time. Either by crating one for a couple of hours or putting the other one in the bedroom. Troy was fine around people when he was younger. We had people visiting us at home and he did not show any aggression even though he didn't like to be fussed around too much. But when he turned 2, aggression toward other dogs and human beings started to develop as we took him out on his daily walks. We tried all methods of leadership, showing calmness and confidence but those were not effective. We think his aggression is mainly out of fear because he would bark excessively when someone approaches. To date, me and my partner are the only two whom Troy trusts and would not attack. He doesn't get along with our other male dog but is totally fine with the female. We do not have access to seeing a dog behaviorist at this point. So at the moment, we try walking him outdoors during less busy hours where there are fewer dogs and people in the area. My Dagger has been sweet as pie since the day we picked him up, in the last 6 months I have noticed that he has started attacking people out of no where. Then after he does it he is sorry. I exercise him regularly and even come home at lunch most days so there is no separation anxiety. Went to vet, blood test look normal, but had a low fever and leg was sore. not sure how to handle this. 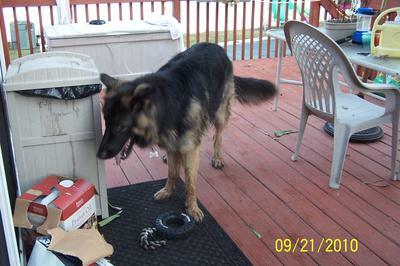 HE is quite a large german shepherd. "You're going to want to give him a motivational correction-- but not one that's too motivational, otherwise there is a the possibility of him becoming defensive. I detail how to do this more explicitly in my "Secrets" book that you can download at DogProblems.com (see below)." We have two older Bernese Mountain dogs who are calm as can be -- basically lumps on the floor next to you. About 2 years ago we got a wild hair and purchased a rescue puppy. She had already been spayed. Early on she showed signs of dominance, which we quickly got under control. As her bad behavior progressed (barking incessantly, aggressiveness toward strangers inside and outside and oftentimes to our family members), we tried 9 weeks of in-home dog training and continued to re-inforce it. Nothing has worked. We have an Invisible Fence and she stays inside it, but any outside event will trigger maniacal barking, bared teeth, and physical "attack mode" with haunches down, ready to jump. She barks constantly outside, and inside will simply stand in front of us and bark for no reason we can see. She has bitten people -- the FedEx delivery person, a contractor who came to our house, and one of our family members. Our neighbors have asked us what we intend to do about this "vicious" dog. We've had neighbors call and ask us to bring the dog in so they can sleep (because of the barking). Most people and friends will no longer come to our house unless we can guarantee that the dog is crated. Is there anything that can be done with our dog, short of giving her back to the rescue foundation? Thank you. I would invest some time learning about the "Nothing In Life Is Free" approach. And then keep a leash and collar on the dog when you're around her and learn to give a motivational leash correction. I adopted my pugapoo, Molly, at 2 months of age. I was told that the owner had children and couldn't keep her. I got her as a rescue. She barks and tries to bite our ankles. It only happens to when I come down stairs. She stands there then goes for my ankles. I stop her by saying no bite but I end up backing up and sitting down. Then she just stops. She barks and growls at my husband trying to bite. She does it to my 15 year old daughter. The only thing we do can to stop it is to pick her up and hold her. She is otherwise well behaved. I have control with her walks, which she gets often. I've started to enter and exit the house which is going well. She finally sat for her food tonight. She got worse after she was spayed. She barks at us at dinner. So we put her in her coup and place her in another room. She finally stops barking. We did that for the first time tonight. She gets into her coup without prodding and is at peace. I am home all day, so she tends to do fine when we are alone. She is friendly with guests. She also tortures the 4 cats. Besides getting a trainer, which we can't afford, do you have any advise? I know she has to be in the bottom of the pack. I'm not sure if my dog Moxie - a hound mix - has dominance aggression or fear aggression. We have had her since she was about 4 months old. We had another dog when we got Moxie who was 13 years old and had to be put down. 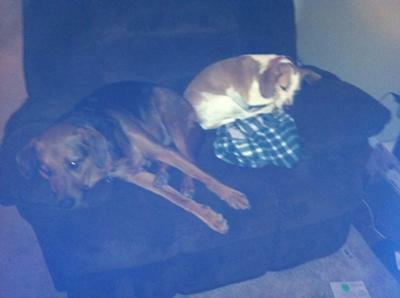 We got Ruby - a Beagle/Jack Russell mix - soon after... which was about 6 months after Moxie came to live with us. They are about the same age (now 3 years old). Both are rescue dogs and generally very sweet. Moxie was never homeless, just bounched from home to home for several months. Ruby was a stray picked up from the Humane Society. She does tend to get out of the fence, so she may have been a runaway. We now keep her on a lead in the back yard when she goes out to prevent her from getting out. Moxie is very bossy with Ruby. If we are kissing Ruby or showing her attention Moxie will come push her out of the way. Ruby at most will growl lowly or "tell her off" in that high-pitched beagle bark. They have been fighting alot, usually caused by Moxie. This is sometimes caused by food, if something falls and they both go after it, Moxie will attack Ruby. Sometimes, if Ruby gets hurt (we accidentally step on her paw) and she yips, it's like it flips a switch in Moxie and she attacks. Sometimes, I don't know what it's about. Moxie does seem very insecure about Ruby. We have to pull them apart, usually by pulling Moxie by the back legs and then Ruby comes after Moxie. We end up putting Moxie in her crate, and lately have been putting both in their crates... just to be fair. They have both gotten hurt, not seriously... bites and scratches, etc. It really worries me. I can't bear the thought of getting rid of either one. Other than their dust-ups (for lack of a better term), Moxie is very well behaved. She listens well and obeys. Ruby is not as well behaved. She is very independent and likes to do her own thing. So maybe Moxie is trying to be her pack leader. First, they need to be crated separately. Second, you need to start with the Nothing In Life Is Free program. You can do an internet search, but I feel that the best explanation is in Adam Katz's book, "Secrets of a Professional Dog Trainer!" -- which you can find at DogProblems.com. You will also need to learn how to correct the instigator-- and how to make your corrections meaningful. (Adam's book is excellent for this, too). In a nutshell, it comes down to respect. If your dogs respect you-- you can tell them, "No!" and your correction will have meaning. If they don't respect you, then it doesn't matter what you say or do. You gain their respect through obedience training, learning how to administer a motivational correction and by adopting a "Nothing In Life Is Free" approach in your household.